As you move swiftly through the shadows, you strike with the grim elegance of a moonless night. The Dark Elven Hunter LARP Blade is a latex free LARP weapon made of innovative Epic Foam and designed for tough, yet safe, LARP combat. 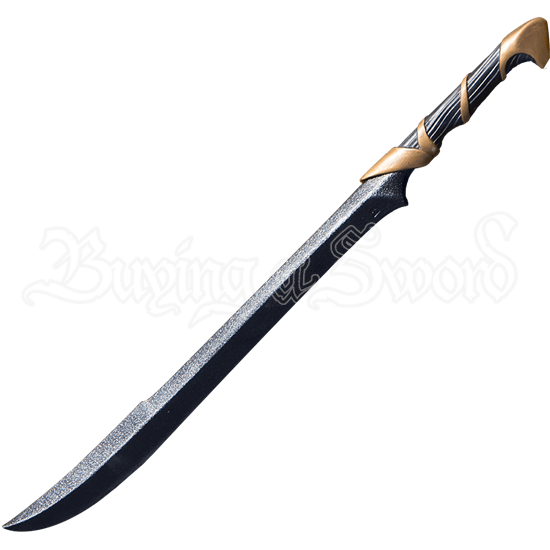 Inspired by the shadowy creatures of fantasy, this elf LARP sword has a graceful design ideal for assassins, rogues, and other characters affiliated with the dark. The curved blade, shaped for slicing action, features a blackened steel coloration perfectly matched with a hand painted polyurethane handle, expertly designed to emulate polished black wood wrapped in antique gold. Shred resistant, stab-proof, and with cushioned edges, the Dark Elven Hunter Blade has the looks of a truly killer sword but is safe and sturdy for live action roleplay combat.